The eatery serves taiyaki, a sweet Japanese waffle cake in the shape of a fish, filled with soft serve in flavours like pandan, red bean, matcha or vanilla. What’s better than eating waffles or soft serve? Eating them together, of course. Calgarians can get their hands on a dessert that combines these two popular treats at the newly opened Uzu Taiyaki. The small Chinatown eatery serves taiyaki, a sweet Japanese waffle cake in the shape of a fish. Traditionally, taiyaki is just served with a red bean paste filling. But in recent years, it’s become trendy to also fill the Japanese dessert with soft serve ice cream. Partners Melissa Luu and Rey Ha, who also own local toy shop Urban Pop Shoppe, discovered the soft serve treat while traveling in places like New York City and San Francisco. In February, they, along with co-owner Tommy Mac, opened a small shop in Chinatown dedicated to the sweet treat. The taiyaki itself tastes just like a waffle, with a slightly crispy exterior and a soft inside. It’s also made just like a waffle, by pouring batter onto an iron with several fish-shaped molds. You can add a red bean or Nutella filling inside the waffle, and then it’s filled with soft serve. 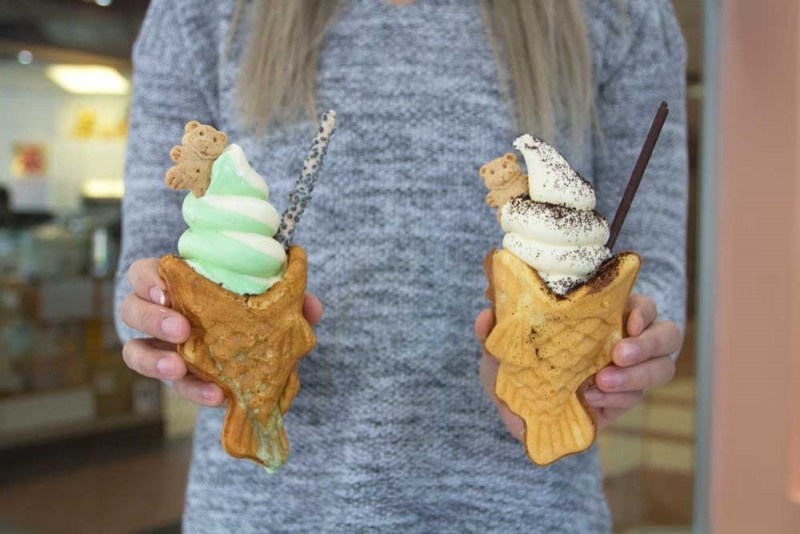 If you don’t want a taiyaki cone (though, we’re not sure why you wouldn’t), you can also order soft serve in a cup or a matcha or regular waffle cone. 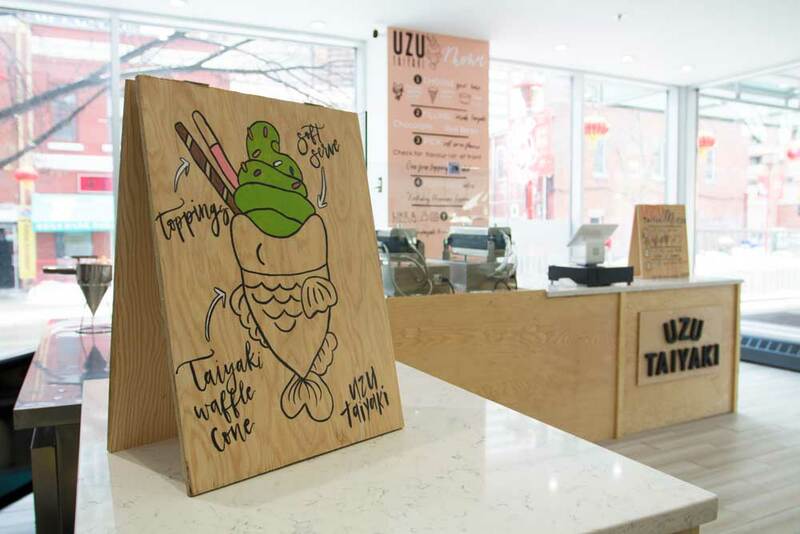 The soft serve flavours can vary, but Uzu Taiyaki launched with Asian-inspired flavours like pandan (which kind of tastes like coconut, but less sweet), red bean, matcha and vanilla. Certain flavours are also available swirled together. You can finish off your soft serve with some of the approximately 15 toppings, which include Pocky sticks, Teddy Grahams, sprinkles and rolled wafers. Fellow Chinatown business The Chocolate Lab also created fresh marshmallows as an additional topping, which are roasted to-order at Uzu Taiyaki. You get one topping for free, and the rest are an extra 50 cents each or $1 for the marshmallow. Uzu Taiyaki is currently in the middle of its soft opening, but will celebrate its grand opening on Friday, March 9. Inside Uzu Taiyaki’s Chinatown location.